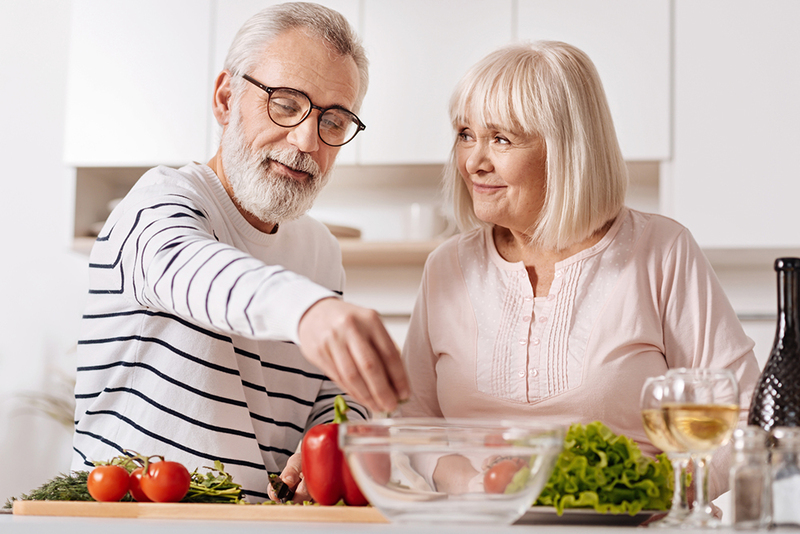 Many Seniors still love to cook for themselves and their families. However, sometimes the problems that come with aging can make the kitchen more hazardous. With some basic kitchen safety, potential injuries can be avoided. These simple modifications can keep your loved ones safe. In the long run, Senior Citizens are happier when they have greater independence. Achieve a safe cooking environment for Seniors with some simple modifications. For example, bright lighting can help prevent kitchen accidents. Consider installing a Lazy Susan. This can provide access to more items in the kitchen without the need for bending and excessive reaching. It can be used in a cupboard or on top of an open counter. Other common hazards in the kitchen are slips and falls. Add non-slip mats below the sink and dishwasher. A padded mat gives added comfort while doing the dishes. Secure the edges of kitchen rugs with double-stick tape. You can keep the kitchen tidy and safe by securing all cords and tucking them behind the counters. Plus, be sure to close cabinets and drawers, as they can cause painful bruises if you run into them. Store everything within reach. Standing on a chair or step-stool to reach the top shelf is a recipe for disaster! Leaving higher shelves empty may feel like wasted space, but it’s better than falling off a chair. Storing heavy items at waist level will be easier to access. Basic kitchen safety includes storing flammable objects away from the stove. Double-check the area around your stove before cooking to ensure there are no towels, napkins, or other flammables. Have a working fire extinguisher close by and know how to use it properly. If grease catches fire, avoid pouring water. Instead, use baking soda or a pot lid to smother any flames. Upgrade to smart technology in the kitchen with a smoke detector working in conjunction with your medical alert system. This smoke detector sounds an alarm in case of smoke and automatically calls you and the fire department. An automatic stove shut-off monitors movement and turns the stove off when left unattended for too long. It then sends an alert to a loved one, previously decided upon. Incorporating these tips provides a sense of security. You’ll worry less about your kitchen set up. By planning ahead and making changes now, you may prevent future injuries. Share this article to help your friends and loved ones learn how to stay safe in the kitchen. The caregivers of Anita’s Angels, Inc. can help your Senior Citizens stay independent as long as possible. We can also shop and cook for our clients should it become a necessity. Call 908-788-9390 to talk about in-home care options.